Step into the Holiday Inn Express Hotel & Suites in Mt. Pleasant, and escape to the utmost in comfort, convenience and quality service. We are the area's newest and finest lodging facility offering amenities and a modern decor that will leave you feeling as if you never left home. Choose either a standard room or one of the varieties of 20 suites available, and experience a worry-free stay that features comfortable bedding and seating, ceiling fans, microwaves, refrigerators, coffeemakers, hair dryers, two-line speakerphones with two extensions and free high-speed internet service. Explore the enjoyments outside of your room in our complimentary breakfast area, cozy lobby, outdoor pool, fitness room or business center. Conveniently located along Interstate 30, the three-story property is within minutes to industrial areas, shopping and recreational attractions. Whether visiting Mt. 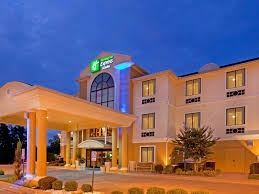 Pleasant for business or leisure activities, include Holiday Inn Express Hotel & Suites as a step along the way.